Time travel- the secret of wormholes. When we think of this vast universe, we consider the vast possibilities and potential it possess. Every moment, it changes and resizes itself. And beacuse of the universe, humans started thinking about the real possibility of time travel. In the late 19th century, time travel has been the common plot for science fiction films, but today standing in the 21st century it sounds to be possible. The theory relates fourth dimension which can make time to speed through in its own way. We all know that there are three dimensions in the real world- length, breadth and height. But there exists another dimension- the fourth dimension, which is supposedly the "length in time". Every possible object that exists in this universe has a timelength, it can be a mayfly living for a day, or the solar system to exist for billions of years more. Because of these reasons, there can be a real possibility to travel through time. And so, comes the Einstein’s Theory of Relativity suggesting about wormholes in space. Several physicists have suggested about the suitable geometries of space and time, with relative motions which can make time travel possible. And it relates the existence of time tunnels through which objects can travel from one universe to another. And that's what we call as wormholes. All around the space, there are wormholes that create a fourth dimensional open space . Usually these are some tunnel shortcuts predicted by the Einstein Theory of relativity, that can produce a link between two time distant places in a 3-dimensional plot, powered by the production of negative energy to pull the objects in and allow them to flow through another universe. There are several conditions to be followed for a time travel to be possible, as suggested by the rules of physics. To travel through time, the object must be faster than the speed of light. And it will be possible only through the use of wormholes, Alcubierre drives and cosmic strings. And the theory suggests, the possibility is maximum with wormholes. The wormholes exist in a billionth or trillionth of the size of a centimeter, which makes the work tedious for tracking it down. In this quantam world, wormholes actually exist, form, reform and disappear linking two time spaces together. Physicists and researchers have thought of the possibility that if the wormholes can be enlarged given enough power and technologies specific to it, giant wormholes can be created leading people and spaceships travel from earth to distant galaxies through it, probably in another time. Scientists have noticed that there are more complexities in time travelling to the past than future time travel. Because the law of nature prevents of forming the past time travel possibility. The most problematic fact is of "paradoxes". It can be called the Grandfather paradox, as most of the scientists say. If a person goes to his past through time, and kills his grandfather, how can there be any possibility of his existence? It seems a puzzled hotchpotch of time and relationship, targeting the existence of an individual. 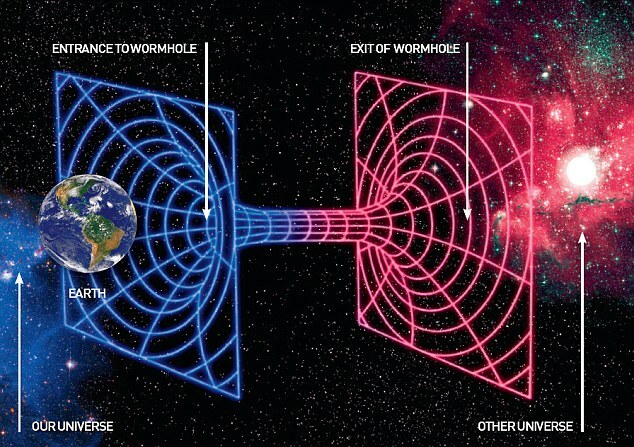 Though there seems to be no possibility of time travel to history, future time travel through wormholes seems to be possible, as that cannot violate nature’s law in any possible way. It can be thought so, because of the fact that time in space goes on its own way, different than the time in earth, what we are experiencing. This has been detected by the GPS systems in network satellites up in the universe, where time travels faster than earth. Recently what made news was the large Hadron collider which can create small tiny wormholes that can lead to time travel. Supermassive blackholes are also very much in the list, but it has its own disadvantages. First of all, any object that wants to travel through it, has to be much much faster than the speed of light to escape the sucking power of the blackholes. And the speed to overcome the blackhole gravitation, is an overwhelming 86,000 miles per second, much near to impossible. So, the bottomline of the subject is, wormholes and blackholes do exist. And in the distant future even if inflation of wormholes and blackholes become possible, there will occur certain complexities related to nature. Scientists and physicists have to think of the never ending challenges time travel puts forward, and think of a solution. But for now, it remains a mystery to be solved in the distant future.